The painting then came to life, and was even enhanced as the backdrop of the opera’s first scene. It was just one of several amazing Impressionist jewels that serve as background for this delicious production. This is a very clever endeavor. With a secondary title,”The School for Lovers,” “Cosi” is a delightful tale of true love going wrong and right and wrong and right. Two soldiers and their fiancés vow their love is “forever” when a wealthy French aristocrat wants to prove them wrong. He bets substantial funds that the “love” won’t remain intact when absence might not make the heart grow fonder. He sends the two men off to battle, leaving their loved ones at home to find ways to fill their time and hearts. Whereas the first scene comes from Manet’s view of the bar at the Moulin Rouge, the second scene is even more wondrous as George Seurat’s “Sunday afternoon on the Island of the Grande-Jatte” is featured. This painting is also the basis for Stephen Sondheim’s “Sunday in the Park with George” and depicts an afternoon of leisure on the banks of the Seine. In the Loveland opera, the Seurat painting takes center stage, with all of the characters in place in the painting on the stage. When the aristocrat sends the two woeful lovers and others in the regiment off to battle, the stage loses its cast and the painting loses its characters – leaving a painting of nature – void of all humans. This is extremely clever stuff. Phoenix Gayles and Dana Kinney play the two women, Fiordiligi and Dorabella. The soldiers are Nathan Snyder as Ferrando and Colin Williamson as Guglielmo. The four have incredible voices and acting charm. 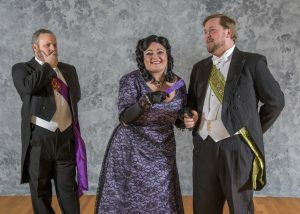 Robert Hoch is in fine form as the scheming aristocrat Don Alfonzo; and Mary Kettlewell nearly steals each scene she is in as Despina, the conniving maid and housekeeper. Although I can obnoxiously retell plot lines of way-too-many Broadway musicals, I knew very little about Mozart’s Cosi Fan Tutte Opera. Correction. I knew NOTHING about Mozart’s opera. This was no problem, as the scenes of the impressionists are so amazing that my interest never floundered. Wonderful subtitles at the top of the stage kept me completely up to date with the arias, sung in English, and the acting is great. The cast is large, with six principal performers plus a large chorus, and an orchestra that played Mozart’s beautiful music to perfection. This opera is produced by Dr. Juliana Bishop Hoch and directed by Timothy Kennedy. The orchestra and choral work are conducted by Adam Torres. 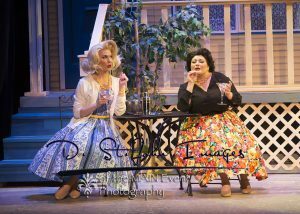 Set and Lighting is by Peter F. Muller, with costumes by Davis Sibley. Mary Catherine Gagnon is scenic artist and graphic design is by Matt Myers. Including the Impressionist period artwork as backdrop and scenery is magic. In addition to the works mentioned by Manet and Seurat, well-known paintings from Monet, Renoir, Signac, and Van Gogh are highlighted. The idea of having famous artwork become integral to the show was originated by The Pageant of the Masters production of the opera in Laguna Beach, CA. Wolfgang Amadeus Mozart’s opera, with lyrics by Lorenzo Da Ponte was first performed in 1790 in Vienna. The timing was unfortunate, as it was performed only five times when the death of Emperor Joseph II resulted in a period of court mourning. It did not arrive in the United States until 1922 when produced by the Metropolitan Opera in New York City. 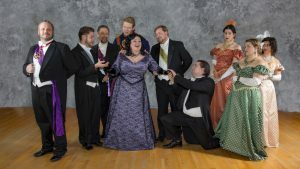 The Loveland Opera Theatre is to be commended for providing opportunities for student groups to become acquainted with the wonders of opera, without possibly being overwhelmed. 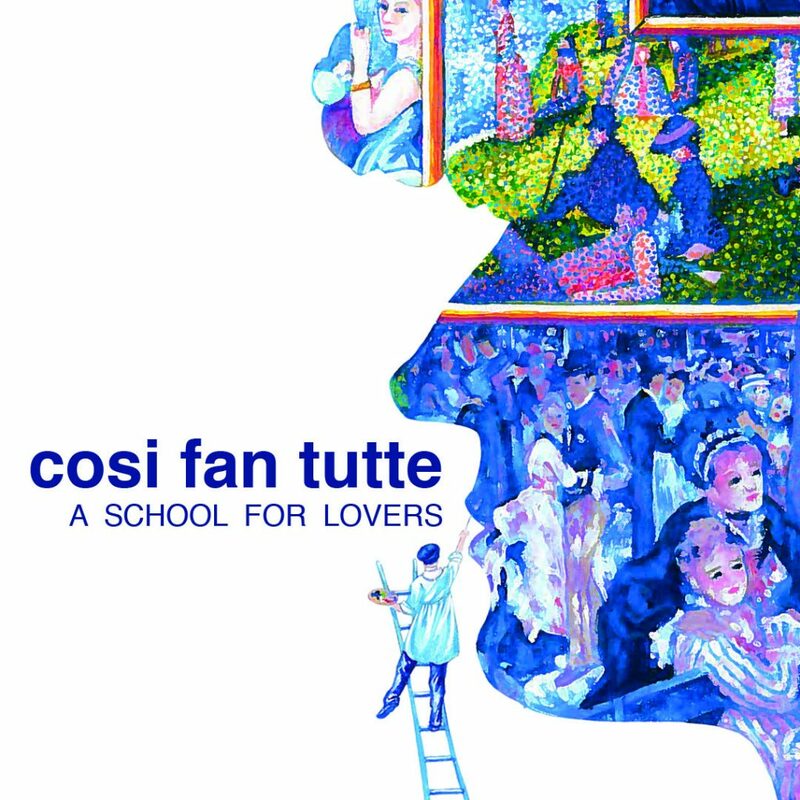 Several abbreviated versions of “Cosi Fan Tutte” are performed this month for such groups. The Opera truly “has it all.” It is a wonder of sight and sound, with glorious music and great comedy. Even some thoughtful insights of what “true love” might just be all about. 2/24, 3/3 at 2:30 p.m. 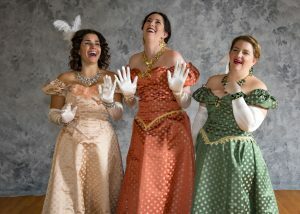 Terrific Voices, Lavish Costumes & New Libretto Combine For Delightful Production of Lehar’s Famous Operetta! More than 100 years ago Franz Lehar’s “The Merry Widow” premiered in Vienna. Audiences and critics were quick to realize the charm of the operetta, and productions quickly spread across Europe, and ultimately throughout the world. It just might be the most popular operetta in history. This winter Loveland audiences were becoming aware that something special was happening with the arrival of the show. 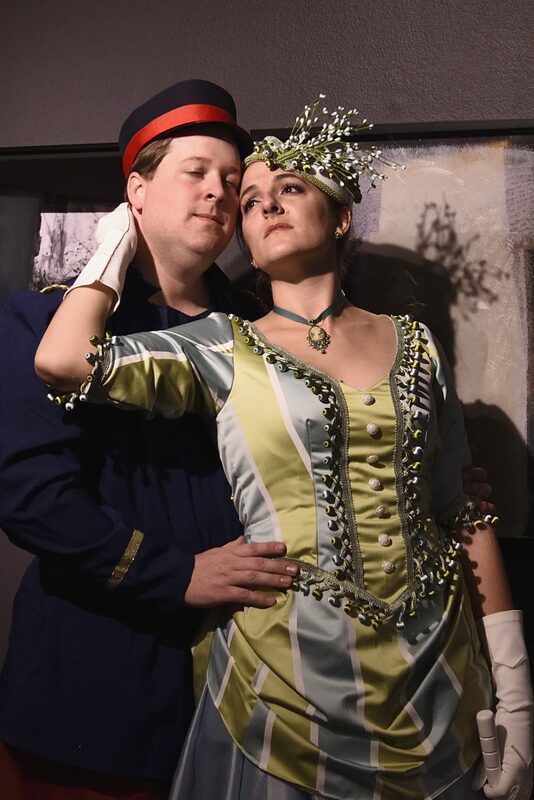 Stage Director Timothy Kennedy has worked on various productions of The Merry Widow” for many years, and went to work writing a new libretto for this production, adding to the wonders of the Lehar music. The result is a winner. Costuming is excellent, as Davis Sibley designed them specifically for this production. Tale is very loosely based on a real situation, although names and locations have been changed. Pontevedro, an imaginary country near Paris is in a financial crisis. The country’s most wealthy citizen has died leaving his fortune to his widow, Hanna. If she should marry someone outside the country, Pontevedro would be in financial ruin. This problem comes to a head when the Pontevedrian Ambassador to Paris is giving a ball at the embassy in Paris to celebrate the birthday of his king, and the arrival in Paris of the widowed Hanna Glawari. The Ambassador learns that he must do everything in his power to keep the widow from marrying anyone not a local Pontevedrian. Mayhem ensues. The Ambassador’s wife is smitten by the charm of a Frenchman who just might be on the lookout to marry the wealthy widow. The Pontevedrian king’s nephew, Count Danilo, is on the short list of possible candidates and is currently working in the Parisian embassy. Danilo had been in love with Hanna many years ago. His uncle refused the request for the two to marry, and sent Danilo away. He is embittered by what happened to him and refuses to be party to the idea of marrying the now-wealthy widow. There is comic relief as the Ambassador goes through a ritual of calling the roll each time he meets with his goofy three-man staff. This is all going on to the lilting Lehar music. “The Merry Widow Waltz” is front and foremost, instantly recognizable. Equally charming, however, is “Vilja Song” which is so beautifully performed that I wanted the audience to stop the show with a standing ovation. That didn’t happen, but the sequence remains rich in my mind as the show’s most brilliant scene. “You’ll Find Me at Maxims,” and “Girls, Girls, Girls” are also familiar songs. The operetta is performed in English. Some of Colorado’s most powerful voices are front and center for this production. Leads are Phoenix Gayles as Hanna, Josh DeVane as Danilo Danilovitsch, Emily Morris as The Ambassador’s wife Valencienne, Nathan Snyder as Camille de Rosillion, and Rob Hoch as the Ambassador. The cast is large, nearly 50 performers on stage plus an orchestra of 13 plus keyboard. Set is designed by Noel Johnston, lighting by Peter F. Muller. Orchestra is conducted by Adam Torres with choreography Sarah Wilhelm. Director and libretto writer Timothy Kennedy has assembled a very talented ensemble, with standout performances by the lead performers, chorus, and orchestra at every turn. 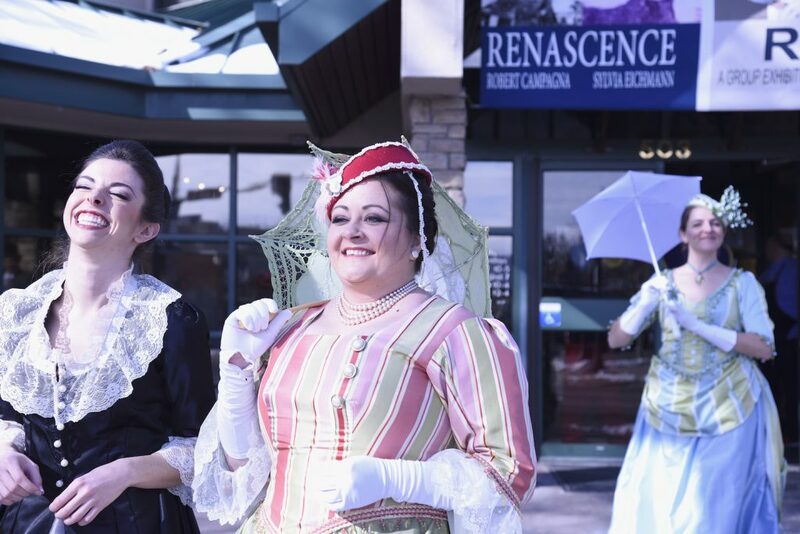 Dr. Juliana Bishop Hoch, Executive and Artist Director of the Loveland Opera Theatre is to be applauded for her work, not only providing excellent productions to Northern Colorado, but for making it possible for school-age students to go to the shows. “The Merry Widow for Kids” is a one-hour instructive introduction to opera and what goes on behind the scenes. Families are invited to attend performances of this abbreviated performance Saturdays February 24 and March 3 at 2:30 p.m. In addition, many schools in the Loveland and Fort Collins area bring students to one-hour versions of the show in late February and early March during school hours. 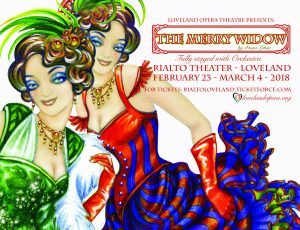 “The Merry Widow” is a Loveland look at the “lost and found” of love, highlighted by incredible individual, orchestral, and choral talents. The show is a somewhat naïve look at romance of a century gone by, displayed with great charm. And that brilliant music. Two neighboring wives in Scarsdale, New York, receive letters from the town lecher – John Falstaff, indicating his desire for rendezvous. He is a not very bright lecher, as the women receiving the letters live side by side in the community, and are most eager to share the silly request with each other. They decide to teach him a lesson by inviting him to their homes, with further plans to make him realize his foolishness. So begins a delightful recounting of Shakespeare’s 1602 play, “The Merry Wives of Windsor,” now set to music. Shakespeare’s merry wives have seen many transformations. Italian composer Otto Nicolai wrote and conducted the music for a German language opera in 1849, with libretto by Salomon Hermann Munsenthal, first performed in Berlin. Forty-four years later, Italy’s Giuseppe Verdi took his turn with the play with his opera, “Falstaff,” premiering in Milan in 1893.